You know what’s the coolest thing about being a music critic? It’s not the free music and occasionally free concert ticket, though those all help ease the financial pain of being a full-time writer. The most thrilling aspect of being a music critic is following an artist and closely watching that particular creative being grow from someone who demonstrated promise to one fulfilling it so completely that he or she surpasses your initial expectations. So many celebrated artists peak early, that watching a more under-the-radar talent go from strength to beast is enough to make you want to break out the pom-poms and hood cheers. 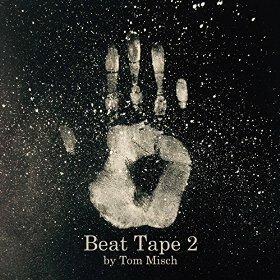 UK composing producer and multi-instrumental artist Tom Misch has provided this reviewer with such a moment with his fourth release and sophomore full-length project, Beat Tape 2. Give me a “T” ‘cause this dude’s alright with me. Give me an “O…” Well, you get the idea. Seriously, listening to how far this independent artist has come from the early precociousness of his instrumental Beat Tape 1 and his collaboration with the vocalist Carmody on their duet EP, Out to Sea, to where he is on Beat Tape 2 is akin to the Great Leap Forward. Misch always had something there, but the material also felt like something was missing, something unfinished and demo-like about one too many of his indie releases. And yet I can keenly remember when I became a fan of the then teenage Misch, something in the infectious hook on the minimalist “Release You” with Carmody caught me unawares and found me absentmindedly singing it at random even as I found the cut and the project that produced it somewhat under-produced. But, Misch’s talent and ability to get under the skin on instrumental triumphs like “Risk” were present to the ear even then. So, I kept supporting the now 20 year-old artist and waiting to hear him step fully into his greatness, a faithful believer. And greatness is all that is on display on Beat Tape 2. The neo-soul constructed, smooth grooved “Wake Up This Day” featuring a very in-demand Jordan Rakei began my love affair with this project of various sub-genres of soul and dance. The soulful house bebop of “Colours of Freedom” featuring the Bearcubs deepened that love to new depths with a ditty that begs a two-step and perhaps an old-school dance circle where different steppers show-off their gravity-defying dance moves. They can continue shaking what their mamas gave them to Alexa Harley’s confidently sung, stripped down house jam “Your Love,” a percussive progression that keeps its groove rolling along as different drum elements weave in and out with perfect execution. An earnest Zak Abel’s sanded tenor grittily offers a “Beautiful Escape” on another unfolding dance floor powerhouse that gives its throb-entranced adherents exactly what the title suggests. On “In the Midst of it All,” a cushiony voiced Sam Willis is more meditative on an unexpectedly sage electro soul soundscape that slides into a ringing mid-tempo banger on the hooks that will get that neck of yours bumping to the rhythm before you know it. The guitar work on “In The Midst of it All” is particularly impressive, as is its interplay with the cuts deftly placed ringing xylophone accents. Misch’s gift is one of subtlety. The songs each have a variety of musical elements that get introduced and hang around in the foreground for a little while to play with and against one another, but the sounds wait their turn so as to avoid clutter and overproduction, giving each a sense of progressive movement that compels attention. Misch has intelligently managed to find that sweet spot in having the spacious minimalism that is becoming his signature while still maintaining the sound of musical fullness, something with which he’d struggled before. It helps that Misch also has an easy way with melody, so that a captivating B-side like the jazzy hip hop soul of “Nightgowns (featuring Loyle Carner)” is breezily done, but far from a throwaway. Perhaps nowhere is the growth more evident than in the comparison between Misch’s prior collaboration with the cooing songstress Carmody and the compositional knockout “Wander With Me,” which has the autumn feel of a signature track by Zo! or The Foreign Exchange. From its guitar work to Carmody’s sultry performance, nothing in their previous EP comes close to being this lived in, melodic, or skillfully rendered. As with the recent, similarly appealing Eric Lau and Tawiah collaboration, Misch and Carmody feel like they’ve been working with one another decades instead of a couple of years. While Beat Tape 2’s handful of instrumentals have gotten less effusive ink spilled on them in this review, it’s not because they aren’t well-crafted or lacking in making a distinct impression; far from it. Competent and musically resonating, they neatly align in a hip hop jazz meets electro soul kind of way as sequencing bridges between the various genres through which Misch travels and sometimes stitches together to make the whole listening experience one of relaxing comfort, even at the times it breaks up the smoothed out material with a danceable moment that always seems to come right on time. Come to think of it, everything about the young Tom Misch’s fourth time at bat seems right on time. As a satisfied fan, the joy that is Beat Tape 2 makes me look forward to even more home runs to come. Highly Recommended.